For good or ill based on the second part, this episode will be one to remember. The whole may be less than the sum of its parts, but the individual parts are quite good though it remains to be seen how they will all tie together. * The moment that follows the stand-off, in which The Doctor tells Clara that there is nothing she can do that could make him stop caring about her - is simultaneously the proof we've been waiting for all season that while The Doctor's latest incarnation may play it cool he really does care deep down and the first sign we've had of The Doctor's feelings for Clara being more paternal than anything else. 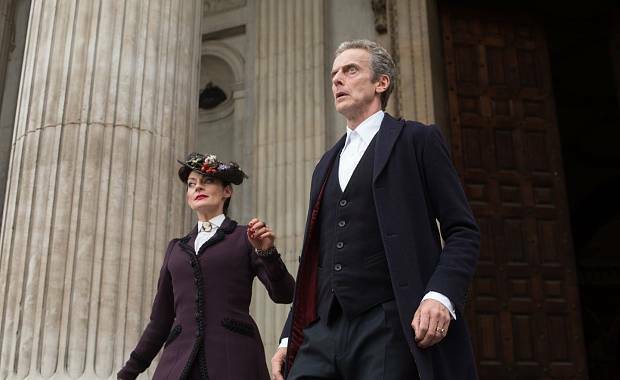 * Michelle Gomez is clearly having a lot of fun as Missy. * The reveal of the Cybermen is played up well. The set design of their pods is reminiscent of Tomb Of The Cybermen and a neat clue for eagle-eyed fans of the classic series. * Another great moment - an honestly panicked Doctor running through the streets of London trying to warn people about the approaching danger. For all of The Doctor's posturing this year about who he is and how much he has changed, he is still the same man - or god pretending to be a man - when the chips are down. No aloof alien scientist here. He is, as ever, The Man Who Fights The Monsters. * The cliff-hanger. Dear gods, the cliff-hanger! * Not a problem with the episode so much as it is with the advertising, but the surprising reveal of The Cybermen was ruined by the poster for the episode. * The middle part of the episode - everything between The Doctor and Clara arriving at W3 and the reveal of who Missy is - seems a bit flat. In fact, one dares to say the subplot with Danny is... boring. * A question that will hopefully be answered next time - how did The Doctor not sense who Missy was? Another Chameleon Arch? As with most Doctor Who two-parters, it's hard to fully judge this episode on its own merits. That being said, the opening is very powerful and - as with every episode this season - Capaldi and Coleman utilize their great chemistry to sell it. It's only in the middle sections that things lag a bit as Steven Moffat starts laying out exposition that may may or may not turn out to be completely meaningless based on the finale. But the cliffhanger is the series' best one since Army of Ghosts, though it remains to be seen if all the build up behind the scenes might turn this episode into this generation of Whovians' Time-Flight.